Legend has it that Arima Onsen was discovered by two ancient gods, “Onamuchi no mikoto (Daikokuten, one of Seven Lucky Gods” and “Sukunabikona no mikoto (gods of medicine)”. One day in ancient times, the two gods visited Arima and saw three injured crows bathing in a puddle. Some days later, they were amazed to see that all three crows had miraculously been cured. Thus, the onsen and its curative effects were discovered. Recorded in Nihonshoki, the oldest record written in Japan, Arima Onsen rose to fame thanks to the frequent visits of Emperor Jomei (year 631) and Emperor Koutoku (year 647). In the early stage of Arima’s long history, only court nobles or monks could visit Arima as the unexplored spa town located deep in Rokko mountain. After General Hideyoshi Toyotomi established Arima town, more people travelled to this remote onsen area, Providing a full-featured experience complete with onsen, accommodation, food, local customs and history, Arima Onsen became the best representation of traditional Japanese Onsen culture, which called Touji culture. Research shows that the onsen culture in Japan stems from Buddhism teachings. It is believed that bathing in onsen can cleanse and purify one’s soul. Although Arima Onsen became famous thanks to the Imperial visits of Emperor Jomei and Emperor Koutoku, its history recorded how Arima onsen declined after that period. It only became popular again thanks to the work of a high monk Gyoki at the Nara era. Monk Gyoki set up numerous monasteries throughout Japan. Besides preaching, he also helped excavate the onsen town, dig trenches, and build bridges and temples. As such, he left behind many great monuments. One day, Gyoki met a sick elderly man at his pilgrimage. Gyoki kindly helped the man and fulfill his requests, then the man revealed himself to be a gilded Buddha and suggested Gyoki to visit Arima Onsen where were hardly known for people at this time. After this mystical incident, Gyoki erected Onsen-ji (temple) with a life-sized statue of Yakushi Nyorai (Buddha of medicine). 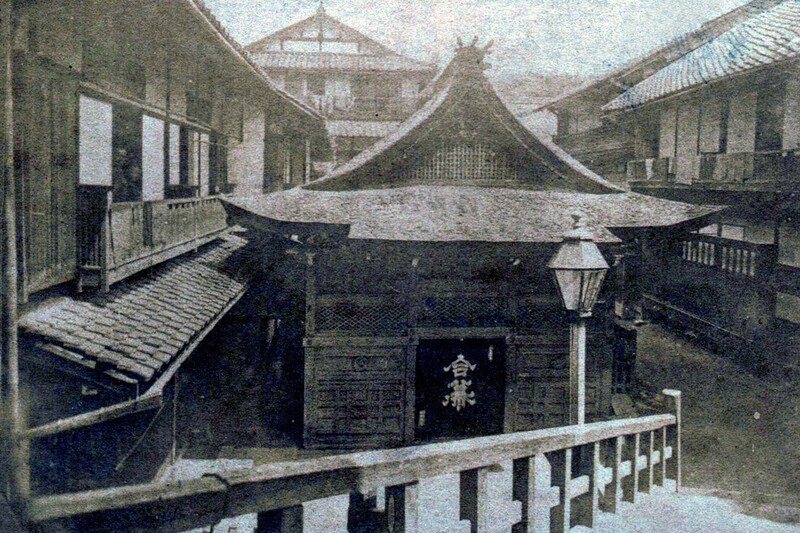 This is how the Onsen-ji (temple) came to be a main landmark of Arima. At Edo era, there is a cultural practice that people had to first pay their respects to the Yakushi Nyorai before taking bath for their “treatment”. Thus, onsen culture became intertwined with Buddhism culture. Unfortunately, Arima experienced a bad flood during the Kamakura era, destroying the town and leaving it deserted for hundreds of years. 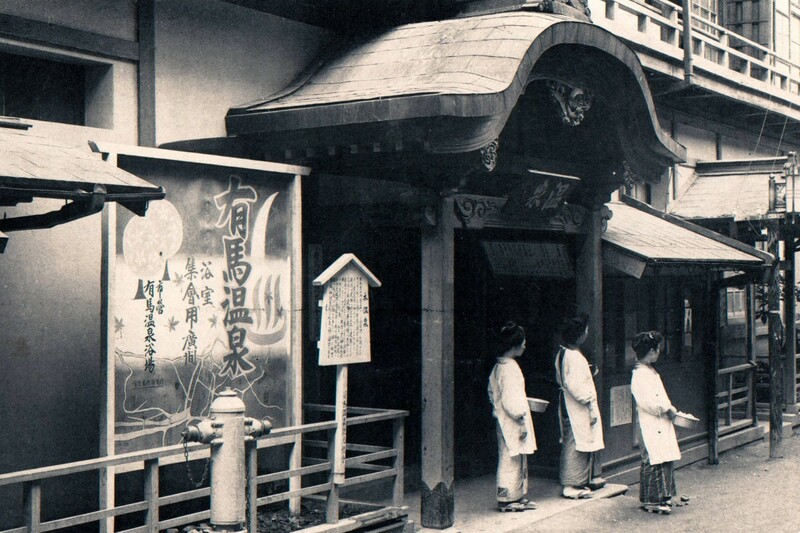 Arima Onsen was later rebuilt by the another high monk Ninsai, a chief priest of Kougen-ji (temple) from Yoshino. God appeared in Ninsai’s dream, he was commanded to rebuild and develop the hot spring town. 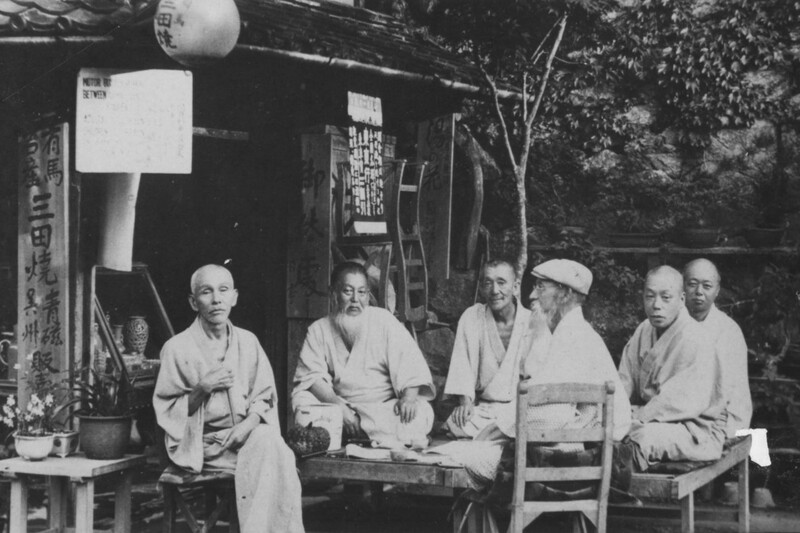 In 1911, Ninsai developed a series of twelve Touji inns (special onsen ryokan for treatment), as a symbol of the 12 gods that guard the Yakushi Nyorai. Today, Arima has preserved many of the ryokans, including a 800 years old Goshoboh. Arima is also known to have one of the oldest ryokans in Japan. There are countless other shrines and temples in Arima. Tosen-jinja (shrine), which worships the Arima guardian gods Onamuchi no mikoto and Sukunahikona no mikoto, holds the annual celebratory Kentoushiki festivalon January 2nd. During it, they offer the first spoonful of spring water to the gods for the prosperity of Arima. 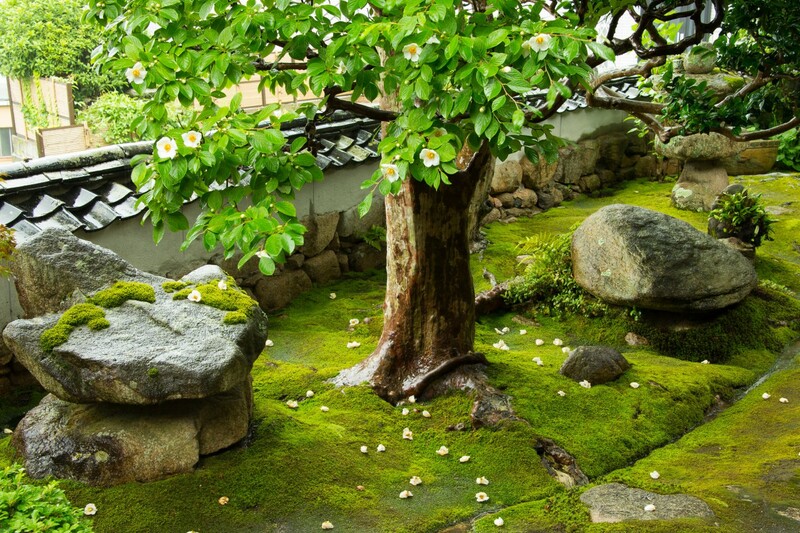 At the beginning of summer, the 300 year old Sarasoju (sal tree strongly related to Buddhism) on the Nenbutsu-ji (temple) grounds gives bloom to elegant white flowers. 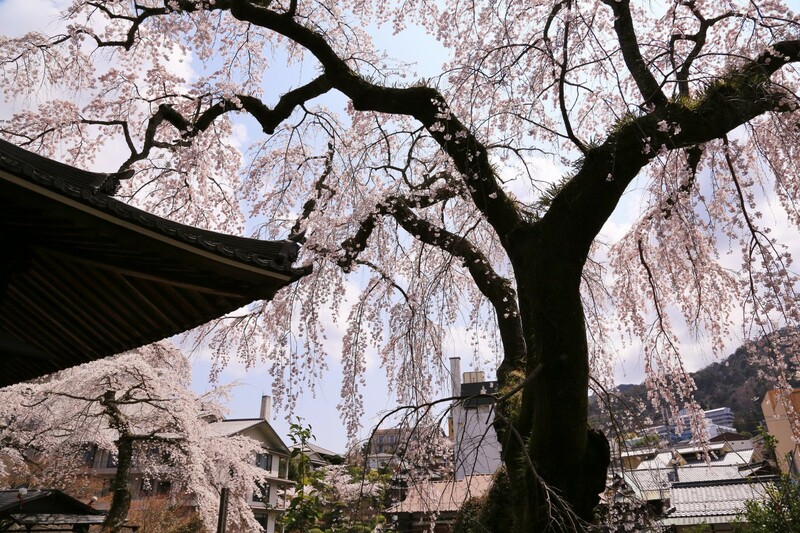 During spring, the 200 year old Itozakura (weeping sakura trees) at Zenpuku-ji (temple) burst into full bloom. 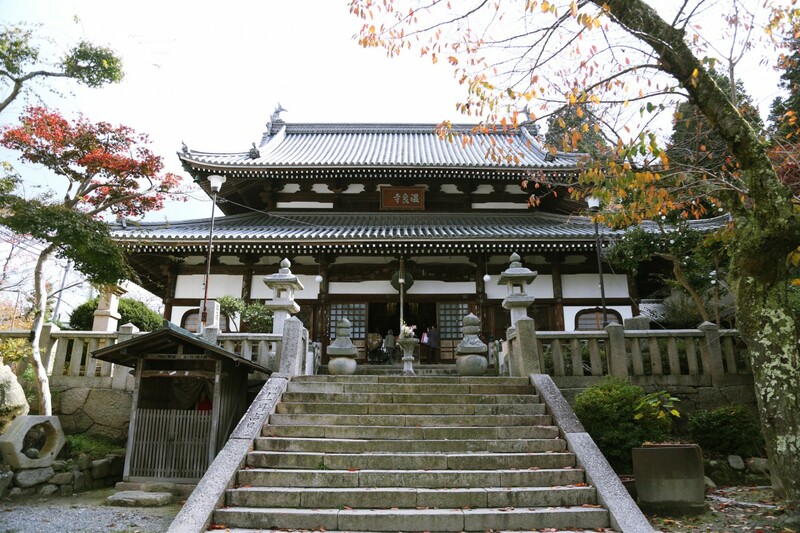 Other historic and beautiful temples that have weathered time with Arima include Myoken-ji (temple), Hosen-ji (temple）, and Rinkei-ji (temple), all of which have protected Arima, while quietly keeping it company over the centuries. Great General Hideyoshi Toyotomi is one of the most famous historical figures with a connection to Arima. 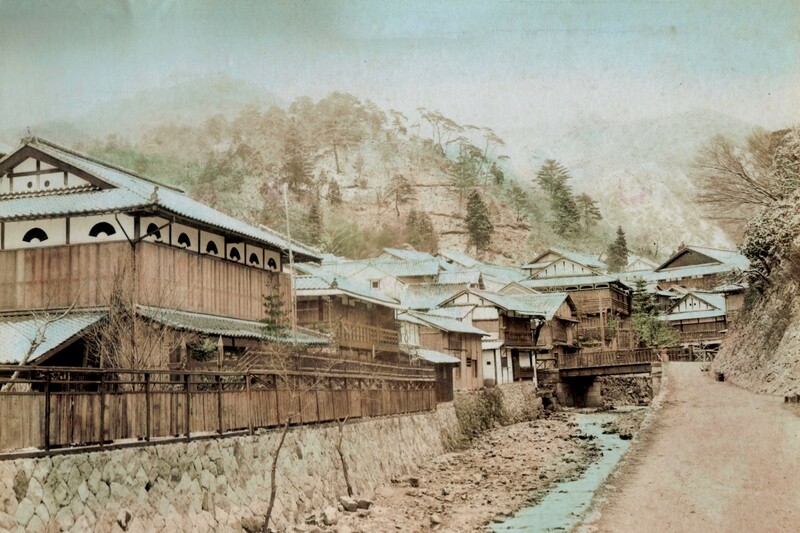 When Hideyoshi achieved victory after many years of war, he decided to reconstruct and repair the damaged Arima onsen. He returned to Arima Onsen many times with his wife Nene, to relax and unwind. The Gokuraku-ji and Nenbutsu-ji were built on the site of villas owned by Hideyoshi and his wife. At the Zuiho-ji Park, he sometimes held tea ceremonies with a great tea master Sen no Rikyu,who played the most important role in the history of Japanese tea culture. Today, Arima holds tea ceremonies every autumn around the time the autumn leaves begin to change colors. With the development of ryokans(Japanese authentic inn), many more people came to visit Arima Onsen, including the Japanese royal family, wealthy noblemen, and scholars. Arima onsen continued to thrive until the end of the Edo era, but it was most prosperous around the early nineteenth century during the culture at Bunsei era. Now, behind the Onsen-ji (temple) stands Taiko no Yudonokan which contains abundant history and cultural relics related to Arima Onsen. These were all excavated after the Great Hanshin Earthquake in 1995. According to records the Taiko no Yudonokan is originally the Yunoyamagoten that Hideyoshi constructed, but ironically died before using. There is a Taikobashi (bridge) and a Nenebashi (bridge) at the water park near Arima Onsen Station. There is even a statue of Nene on the bridge. 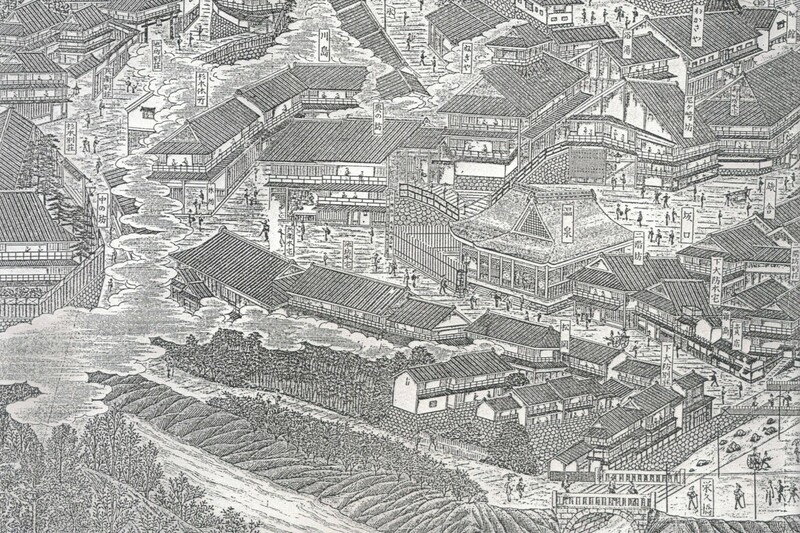 Besides the historical sites of Hideyoshi, a scene showing soldiers arriving at Arima Onsen to treat their wounds was featured in the Japan NHK drama Gunshi Kanbe. The Great Hanshin Earthquake caused serious damages to the Kobe area; however, the Arima Onsen tourism committee constantly drafted new plans to revive the tourism business. Today, tourism has recovered and Arima has reclaimed its position as one of the top spa towns in Japan. On top of that, Arima is actively expanding and stretching its tourism resources to charm its visitors. A few examples are the Taiko no Yudonokan, the Arima Ryofu Kawazashiki summer festival and the Arima alley art project. The Arima tourism board has also been partnering with its overseas neighbors. Arima collaborated with its sister onsen Jianshi of Hsinchu County, Taiwan in order to encourage even more visitors to discover and experience the unique Arima.